Towards the end of the Easter Rising, on Friday April 28th, 1916, some of the fiercest fighting and the worst atrocity against civilians in the week-long insurrection took place. 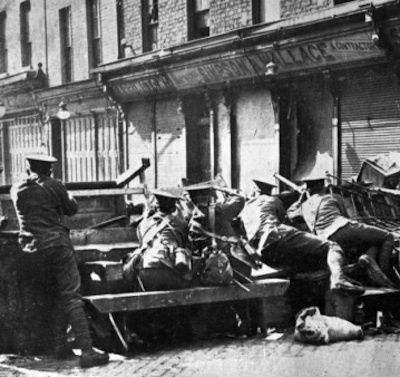 The insurgents’ position around North King Street was one of the most hard-contested combat zones of the week. It straddled the route towards the GPO along the north side of the river Liffey, only about ten minute’s walk from the rebel headquarters at the Post Office, in a mesh of little streets and tenements behind the Four Courts. Ned Daly’s Volunteers had barricaded each of the streets and it was here that the most vicious street fighting of the week occurred. Even with the aid of an armoured car, the British troops made slow progress in taking the street. At close range, death was waiting around every corner, from behind every chimney and behind every barricade. Starting on Thursday, the British tried to smother the enclave. Mostly they avoided direct fire by tunneling through the walls of the slum houses, but one Major Sheppard decided on a frontal assault. By the end of the week, the area was still not cleared. The South Staffordshire regiment under a colonel Taylor advanced, in two days, 150 yards down North King Street, losing 11 dead and 32 wounded. Taylor took over the Bolton Street Technical School with his men deployed on the roof of the building. When an armoured car arrived it went slowly up North King Street, firing all the time. The British troops sheltered behind it and were able to enter the houses. General Lowe had ordered that, ‘no hesitation was to be shown in dealing with these rebels; that by their actions they had placed themselves outside the law and that they were not be made prisoners’. However it was the civilians on the street that took the brunt of the consequences of this order. Infuriated with the losses they had suffered, the troops broke into the homes of the locals and shot or bayoneted 15 civilian men whom they accused of being rebels. They shot dead three men at 170 North Kings Street, then broke into number 172 and killed two men, in number 174 two more were shot dead and in 27 North King Street another four men were shot dead. Ellen Walsh, a resident of North King Street, recalled soldiers pounding on her door until she opened, and demanding, “Are there any men in this house?” Thirty soldiers ransacked the house, “like wild animals or things possessed”. They took the two men in the house aside, one of them Walsh’s husband, and killed them. At number 177, two men, Paddy Bealen, a 30 year old pub foreman and James Healy a 44-year-old labourer at the Jameson Distillery were killed. A woman at number 177 told an inquest into the death of Paddy Bealen, ‘They brought Paddy down into the cellar again and when they brought him into the cellar they were told to shoot him. [She asked the soldier] “Why couldn’t you let him off?”, and he said, “No because the officers have seen him”. The soldier said that the man said his prayers and though he was not of his creed the soldier helped him say his prayers, because he pitied him and then they said they could not shoot him fair-faced. They told him to go down to the foot of the stairs and they let bang at him’. About two weeks later, on the 10th of May, Bealen and Healy’s bodies were found buried in the cellar of number 177. It was this discovery that prompted an inquest, in which the jury found that the two had, ‘died from shock and haemorrhage, resulting from bullet wounds inflicted by a soldier or soldiers, in whose custody he was, an unarmed and unoffending prisoner’. Colonel Taylor, who had been in command that day told the court, ‘no persons were attacked by the troops other than those who were assisting the rebels or who had arms in their possession’. The Court refused to accept his statement as accurate. The mothers and wives of those killed were invited to try to identify the soldiers in a line-up at Straffan barracks in Kildare, but were unable to pick them out. At the military court of inquiry, the presiding officer Colonel Maconchy, who thought the South Staffords were, ‘a quiet and very respectable set of men’, ruled that no specific soldier could be held responsible for the killings. The Inquiry ultimately took no action against Colonel Taylor or his troops. Officer Commanding in Ireland, General Maxwell’s conclusion was that such incidents, “are absolutely unavoidable in such a business as this” and “responsibility for their deaths rests with those resisting His Majesty’s troops in the execution of their duty”. In a private brief prepared for the Prime Minister, Asquith, senior civil servant Edward Troupe judged that in at least one case, that of the killing of James Moore, one Sergeant Flanders should, under normal circumstances, be charged with murder. Elsewhere, he found that soldiers whose explicit orders were not to take prisoners, ‘took to mean they could shoot anyone they suspected of being an active rebel’. ‘The root of the mischief’, he concluded, ‘was the military order to take no prisoners’. Troupe thought, ‘If the case had occurred in England, the right course would be to refer the case to the D of PP [Department of Public Prosecutions.] However, under the circumstances, he viewed taking any action against the troops as ‘undesirable’. ‘There are many points that could be used for hostile propaganda…nothing but harm could come from this’. The results of the Court of Inquiry were in fact buried and not brought to light until 2001. The killing of 15 civilians at North King Street was one of the worst acts committed by British forces in Ireland in the 20th century – on a par with the Croke Park shootings just a mile or so to the north of North King Street in 1920 in which 14 spectators at football match were gunned down. One Cumman na mBan activist remembered that news of the killings increased the hostility aroused among the Irish public by the executions of the Rising’s leaders, ‘next came the news of our men killed in action, of soldiers shooting down our innocent people in their homes as occurred on North King Street’. However the incident is not very well remembered today and surprisingly little propaganda was made out of it, even at the time, by the republican movement. One reason for this might be that the scale of death in the five days of fighting in Dublin- 447 people killed and 2,585 wounded (of whom 252 killed and 2,217 wounded were civilians) – was much greater than in any other single incident in the Irish revolution, dwarfing the events on North King Street. Another reason is that there were other, more high profile cases of British misconduct for nationalists to vilify. The leaders of the Rising were executed within days of surrendering and the famous pacifist, Francis Sheehy Skeffington, who had been trying to organize “citizen police”, to stop the looting, was taken to a cellar and shot along with six others by an officer named Bowen Colthurst at Portobello barracks. A court martial was held but it found Bowen Colthurst to be insane and not liable for his actions. What does the incident tell us about British rule in early 20th century Ireland? Let’s start with what it was not. It was not, like the Nazi suppression of the Polish uprising in Warsaw in 1944 in which tens of thousands of civilians were executed, a semi-genocidal regime in action. There were no wholesale massacres of men, women and children in Ireland in 1916 or afterwards. At North King Street, the men, accused of being irregular fighters, were shot out of hand by troops in the field. As such it had something in common with the German atrocities in Belgium against so-called franc tireurs in 1914. But again, in five months the Germans killed some 6,000 civilians in such reprisals. The British total in Ireland from 1916-21 does not even come close to matching that figure. And yet, there is something in the North King Street massacre that sums up how British rule in Ireland was never truly democratic. First of all the incident was not unique, even before 1916. In 1914, the Scottish Borderers’ Regiment fired on a riotous crowd at Bachelor’s Walk, in Dublin, killing three people and injuring 85. A Court Martial was duly held, but as in 1916, no punitive action was taken. The civil servant Troupe noted that had the North King Street shootings taken place in England, the soldiers would certainly have been charged with murder. But Ireland was different. In the end, it was ruled without genuine consent and the authorities could not afford to publicise, let alone punish, the excesses of its soldiers. The great achievement, in a sense of the Easter insurgents was to provoke the state into actions which under normal circumstances it would never have conceived of and thus pushing the nationalist public away from passive acceptance of British rule and towards opposition. Cold comfort this, though, to the families of the men shot before their eyes in a northside Dublin slum street in April 1916.